Most technical photography books—the ones that are more about producing images than about creative expression—deal with pixels and the digital photography medium. These books discuss Photoshop techniques, speedlight setup, working with lenses or any number of other hardware or software topics. It’s pretty rare to read one that discusses denatured alcohol, emulsions and other hands-on techniques that bring back memories of the darkroom. 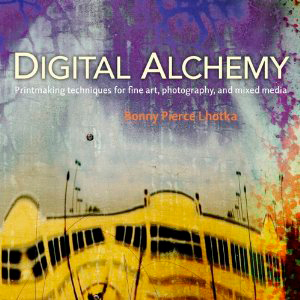 Digital Alchemy by Bonny Pierce Lhotka is just such a book, and I really enjoyed reviewing it. Digital Alchemy is more about digital printmaking than digital photography, but producing the initial transfer images involves photography, Photoshop and whatever digital tools are needed to realize the artist’s vision. Bonny produces her own print transfer products (such as the SuperSauce medium that is used often in the book) and has done extensive testing and experimentation to formulate the techniques in this book. Her pedigree is a strong foundation for the book. A lot of the book is made of printmaking tutorials. Most require creating an inkjet print on transfer film, applying a transfer medium and then the actual transferring of the image to one of a variety of surfaces—including metal, wood, stone and even metal leaf (including aluminum foil!). Bonny has created techniques for all of these projects and Digital Alchemy really feels like a cookbook—follow the instructions, play with the techniques, and in the end you’ll have a finished product in your hands. This combination of printmaking craftsmanship and digital creation is very satisfying and fun. I don’t always view DVDs that come with books because they usually contain images and photos from the book’s tutorials. In Digital Alchemy‘s case, however, the DVD contains an hour of well-produced video tutorials showing Bonny in action on a few different projects. I thought they were clear and well-done, and nicely complemented the book. I have seen worse video tutorials being sold by themselves for a lot more money. Here, you get the video and a book for a fair price. Digital Alchemy is not for everyone: if working in a darkroom sounds messy and unappealing, then you probably aren’t one to apply smelly solutions to film and materials you get out of the home improvement store. However, photographers who started in film photography or even started out as painters and printmakers will absolutely love it. I highly recommend it. Previous PostBOOK REVIEW: Andy Hertzfeld’s Revolution in the ValleyNext PostBOOK REVIEW: Learn You A Haskell For Great Good!